Recently, the adequacy of training for endoscopy in general surgery residency programs has been questioned. Efforts to improve residency education in endoscopy as well as judging competency are ongoing but are not well studied. 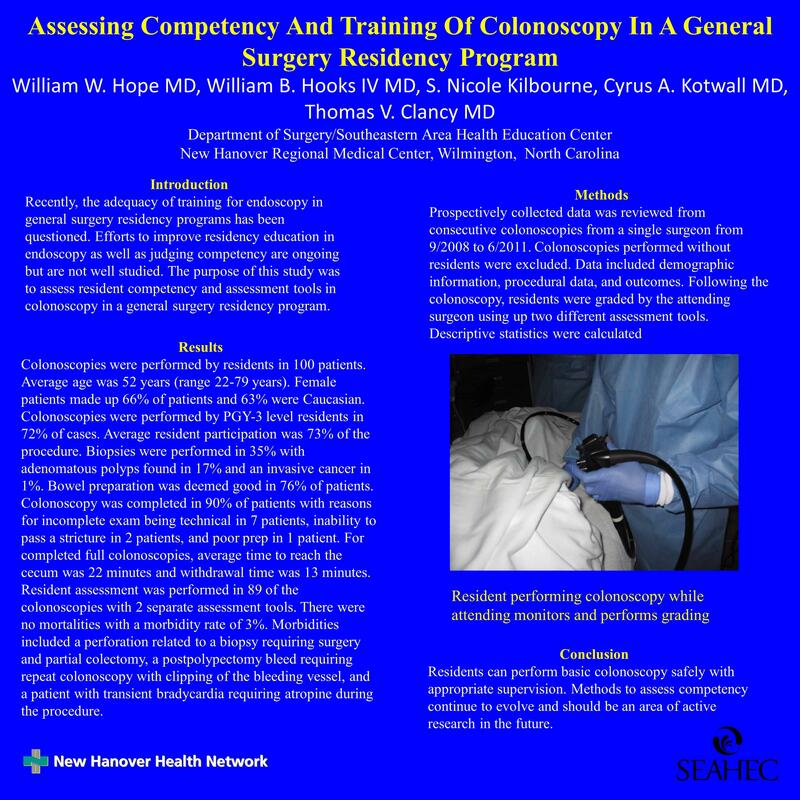 The purpose of this study was to assess resident competency and assessment tools in colonoscopy in a general surgery residency program. Prospectively collected data was reviewed from consecutive colonoscopies from a single surgeon from 9/2008 to 6/2011. Colonoscopies performed without residents were excluded. Data included demographic information, procedural data, and outcomes. Following the colonoscopy, residents were graded by the attending surgeon using up two different assessment tools. Descriptive statistics were calculated. Colonoscopies were performed by residents in 100 patients. Average age was 52 years (range 22-79 years). Female patients made up 66% of patients and 63% were Caucasian. Colonoscopies were performed by PGY-3 level residents in 72% of cases. Average resident participation was 73% of the procedure. Biopsies were performed in 35% with adenomatous polyps found in 17% and an invasive cancer in 1%. Bowel preparation was deemed good in 76% of patients. Colonoscopy was completed in 90% of patients with reasons for incomplete exam being technical in 7 patients, inability to pass a stricture in 2 patients, and poor prep in 1 patient. For completed full colonoscopies, average time to reach the cecum was 22 minutes and withdrawal time was 13 minutes. Resident assessment was performed in 89 of the colonoscopies with 2 separate assessment tools. There were no mortalities with a morbidity rate of 3%. Morbidities included a perforation related to a biopsy requiring surgery and partial colectomy, a postpolypectomy bleed requiring repeat colonoscopy with clipping of the bleeding vessel, and a patient with transient bradycardia requiring atropine during the procedure. Residents can perform basic colonoscopy safely with appropriate supervision. Methods to assess competency continue to evolve and should be an area of active research in the future.